Sorry I’m late… but I’m sure you can guess why that is. The news has been a little cryptic the last 36 hours and we’re all waiting… I got tired of waiting so I started writing again. I figure it’s the least I can do. After the press conference, we took a minute and assessed the schedule between cleansing breaths. There would be no government meeting, so we might actually have free time in between our next meeting and the long ride to Seongju! We packed up and moved along, a little late but doing well on time. Our 11:00 was with the National Conference of People in Sovereignty (NCPS.) We arrived to a variety of men that appeared to be from all different professions. Business cards were presented and we took our places around the table. I didn’t talk much during this meeting. I felt the need to take some notes as I wasn’t as familiar with this organization. I didn’t remember them from our packet of readings and had to go back into my file folder to look at their bio. In a nutshell, they are described as an organization looking to carry on the spirit of the candlelight uprising. If you want a little more info, check out the Resource List. Going around the table, most of the men were older, having been involved in the democratization fight since the 1960s and 1970s. For our purposes, we’ll concentrate on two men. One of them was Dr. Kim, wearing a shirt with large parrots on it. Originally a student, he was accused of being a spy while working and studying in Eastern Germany. He was thrown in prison for 12 years, nearly receiving the death penalty. Amnesty International made something of a famous case out of him. He now studies international issues on the Korean Peninsula. Dr. Lee sat two down from Dr. Kim. According to him, he held many jobs in many lives, though he was most excited to tell me about designing trains. 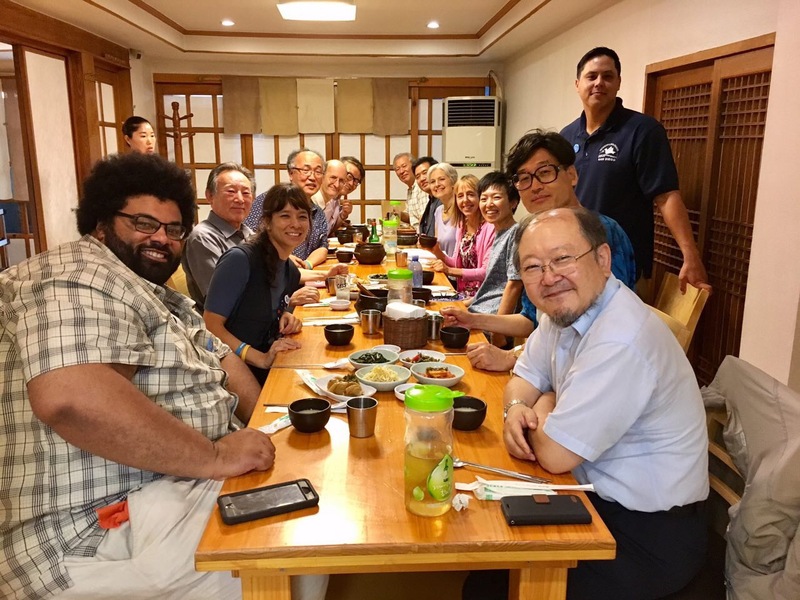 What followed, once we were settled, was a fascinating conversation about reunification in Korea. The discussion varied but essentially where folks came down was that unification and peace are equally important and can’t happen without each other. More folks wanted peace first over unification but recognized that when South Korean (SK) folk talk about reunification, they’re talking about absorbing North Korea (NK) completely. Many NK folk think a process of peaceful coexistence happens with unification, so there’s clearly a wrinkle there that someone needs to work out. The discussion was animated, particularly between Dr. Kim and Dr. Lee. It was amiable and the differences were minor. But the major points were in alignment with what we’d previously heard: the US needs to calm things down and appears to be the aggressor but only the US can change that. Right now no one is talking so it is clear who needs to start the conversation around nuclear weapons. Our hosts from NCPS mentioned that this could be a possible avenue to build a path to peace, possibly welcoming additional foreign investors like Russia or China to participate in the same space as the United States. The translator sitting next to me was excited, mentioning that they’d never heard this before from such a left-wing member of the National People’s Action. Somewhere in there we had lunch together and, after some serious Korean food, we took a few photos together and said our goodbyes. We took a few minutes to walk around for a bit in the tourist section. From there we took the long drive to Seongju. It would be hours, and many of us slept. I stayed awake, enjoying the peaceful scenery as we left the big city.